Our children should learn to say ‘Thank you.’ And No. It’s not just about good manners. Here’s why. It’s so common for females to respond like this that it almost feels weird when they act in contrasting ways. For example, there’s a Brazilian family that lives across the street from us with two girls, ages 10 and 12. They were out front of our house yesterday, and I said, “I heard you are good singers. Is it true?” They both smiled and said yes. They didn’t downplay their ability or shy away. They didn’t need to be nationally-recognized to recognize themselves. I wasn’t only impressed; I was surprised. I asked them to sing a song for me, with zero expectation they actually would, but they caught me off guard again. The two of them stood beside each other in the driveway and sang the Star Spangled Banner in its entirety. They didn’t waver, not even when my 4-year-old had a near melt-down on the sidewalk. I admired them and wondered why so many others don’t readily accept compliments. Are women accustomed to denying themselves? People often tell me they like my hair, and my response is usually some version of, “This crazy mess?” People compliment my home, I say, “Oh, it’s getting there.” Does it take something spectacular for us to feel worthy? Are we teaching our children to do the same, and what might be the repercussions? Dr. Guy Winch, a clinical psychologist, says one of the reasons people shy away from compliments is that they seek to verify their own perceptions of themselves. When someone with low self-esteem receives a compliment, he doesn’t want to accept it, believe it, or disappoint the person by not being able to live up to their expectations. But other times it has nothing to do with self-esteem. To be honest, my hair is amazing, so why do I downplay it? I think it’s more of a cultural thing like we are raised to believe that the act of accepting compliments is really equivalent to bragging, and deflecting them is humble. In reality, though, there’s nothing respectful about refusing to receive our own awesomeness, and nothing virtuous in being skeptical of our worth. Owning and celebrating our gifts (however big, or small, or average they may be) gives us confidence, and confidence is the driving force behind sharing our gifts with the world. The way we speak and think influences our perceptions. Margie Warrell, a coach and leadership developer, says, “Psychologists have found that our subconscious mind interprets what it hears very literally. The words that come out of your mouth, therefore, create the reality you inhabit. 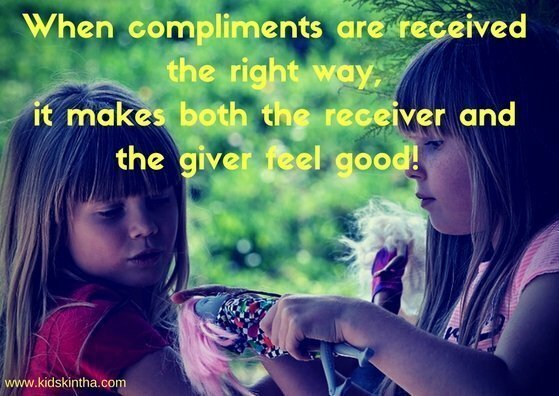 For better or worse.” When we undermine compliments, we undermine ourselves. We must teach our children that doing so is not a sign of kindness and modesty. The other day, we were at our community pool. My preschooler started telling another neighbor about how good he is at swimming. I felt mildly embarrassed like maybe a quick lesson on the norm of not speaking too highly of ourselves was in order. Then I giggled with pleasure that he actually felt so sure of himself, and open with others in sharing his excitement. I want him to keep whatever positive inner dialogue he has that motivates this. I don’t want to pepper it with doubt by telling him to be confident, but not too confident, know that you’re amazing, but pretend to others you don’t. I stepped back and let him do his thing (my favorite parenting strategy). 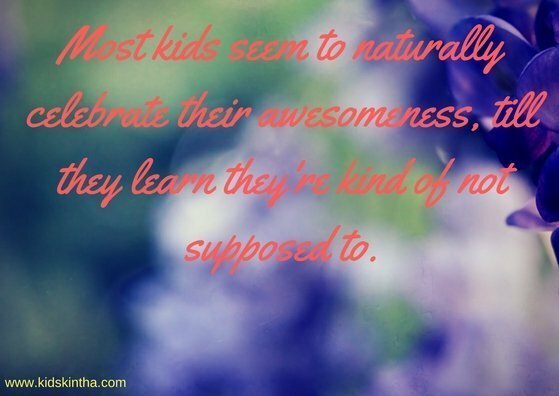 Most kids seem to naturally celebrate their awesomeness, till they learn they’re kind of not supposed to. I refuse to be the teacher of that. Unpleasant emotions and reactions arise in us but usually have a purpose. My preschooler was getting frustrated trying to draw hearts the other day. He wanted them to look perfect. I told him to talk to his frustration and say, “Thank you for coming to visit me to let me know I need to take some deep breaths.” Then we talked about if he needed to take a break or simply stop being so hard on himself. By thanking his frustration, he was aware of his emotions, without letting them take over him. I ask this as part of our bedtime conversation. He acknowledges things like his fast running, good listening, and kindness to his brother. In answering these questions, it’s clear that we don’t need to be rocket scientists, Olympian athletes, or Mother Teresa to feel good about ourselves. We are deserving just the way we are. I’m undergoing some positive changes in this process. Now, when compliments come my way, I smile and say thank you. It makes me feel good and makes the giver feel good too. We experience a momentary connection in the celebration of goodness, and the world instantly feels like a better place. I say thank you, not only because I’m worthy, but because my children are watching me, and I want them to know they’re worthy, too. Sometimes my son pouts and says things like, “I don’t do nice things for my family.” To statements like these, I tell him how important it is to talk kindly to ourselves. I tell him that we believe what we say and that we must say good things about ourselves. When I was 17, I worked in a restaurant as a hostess. I used to deny tips people offered me out of “niceness.” One of the older servers saw me do this and told me, “Always accept. If someone wants to give you something, it’s because it makes them feel good and because you deserve it. Take it, smile, and say thank you.” This is the same advice I will give on accepting compliments. We are all worthy of feeling good just as we are. What we do naturally is a contribution, even if it’s making people smile, being gentle with the baby, or break-dancing to the Police. Children who don’t accept and acknowledge their own goodness are holding themselves back by their own criticism, perfectionism, or insecurity. The result is a society of people who are too nice to be confident and too unassuming to know their worth. The result is a world of goodness denying itself. When we break this cycle, our children won’t just feel happy, they will feel empowered, and everyone reaps the benefits. It’s time we let our children know the truth, that self-denial is not virtuous, and self-love is not vain. It is in our ability to love ourselves that we can love others. It is practising gratitude with ourselves that we can do it at large. By teaching our children to thank themselves and accept others’ compliments with grace, the world might just become a healthier, more functional place. Amanda Elder is a writer with a background in education and child development. She now prides herself in also being a professional diaper-changer and sword-fighter. She mostly writes about parenting, marriage, and women’s issues. She lives in Orlando, FL with her two sons and husband who is a resident physician. You can also find her on Facebook, Instagram and Twitter. Her writing has appeared on Scary Mommy, Huffington Post, Parent.co and several other places. She blogs on http://www.stayathomepanda.com/.